Here I am at Day 5 of the Black and White 5 day Challenge and it’s the ‘big reveal’, though I gave the game away yesterday with my Day 4 photo. You knew all along it was Barcelona, didn’t you? And now, with the help of a little WordPress magic, you can see both colour and black and white versions of my photographs. Which would you choose? Colour, or black and white? In spite of myself I did enjoy the challenge, and have to thank Pommepal and Wilbur’s Travels for nominating me. They would love a visit from you. My last nomination is Elaine at I used to be Indecisive. We meet every week on Six word Saturday and share our love of Snoopy. I have a great collection of Charlie Brown cartoons which I’ve acquired from her blog. (thanks, Elaine!) I look forward to seeing her take on the challenge. I’m going to finish with Sagrada Familia, in colour, of course. Too glorious for words, isn’t it? Hopefully see you tomorrow. Don’t forget to bring your walking shoes. My favorites are the images that have the vintage quality in your post processing. They have an appeal that is sometime missing from technicolor, which can distract from architectural features. Thanks, Sally! 🙂 I much appreciate your comments. Hi Sherri 🙂 I guess I’m just a colour girl 🙂 I’m making a concerted effort on my Inbox this grey afternoon but I no sooner empty it (well, part way… ) and it’s off again filling up 😦 I should get a life! 🙂 Hugs, and thank you. Congratulations on all five beautiful photographs – B&W give a whole different dimension to the scenes. I’m usually a color person, but I prefer the sepia tinge on these. Except for the Sagrada ceiling. Congratulations for completing the challenge!! Well done Jo! Thanks, indah 🙂 I quite enjoyed it, once I got going. Love your B&W series, Jo! 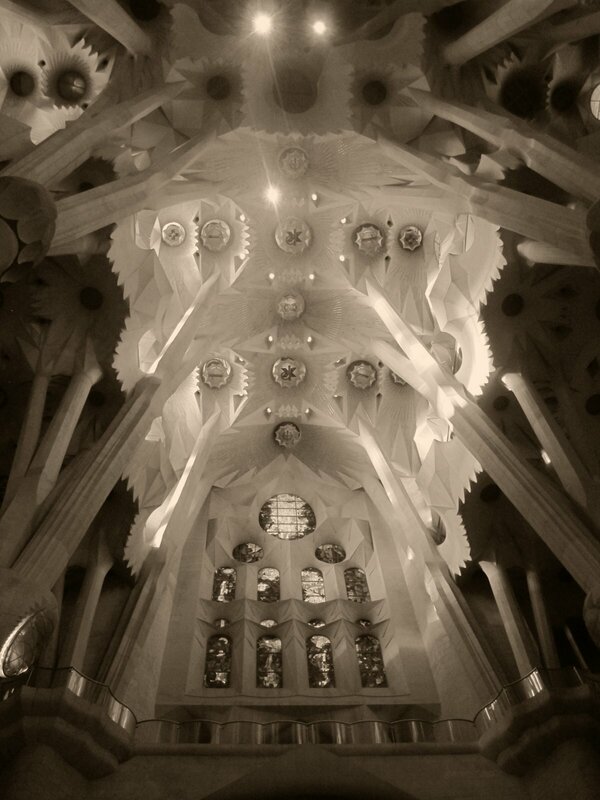 Sagrada Familia is glorious in B&W, well done! Thanks very much, Amy 🙂 Always a pleasure to have you here. I never thought I would see you in Black & White :D. Lovely results, Jo! The second your back was turned, Paula! 🙂 I was gently pressured into it. What a fantastic ending Jo and I thought doing the slide show was a brilliant idea I loved the way they morphed from colour to b&w and back again and again and again…..I have not seen Sagrada Familia and I did think it looked very imposing and majestic in monochrome but it just glowed when in colour, and I liked day 1 and 2 in b&w but the bubble man came to life in colour and number 4 I liked both ways… It was a fun challenge and I enjoyed all your photos. Thank you very much for pushing me (gently) in that direction, Pauline 🙂 What I’m loving is different people’s perceptions and preferences. Love to you and Jack! mi piace molto la foto che sembra di stare su una astronave aliena…ma dove sono i marziani? Stunning last photo Jo. We did not visit Barcelona when in Spain. What a shame. It has a big reputation, Sue, and I was surprised and delighted to find that it exceeded all my expectations. 🙂 Have a happy week!